Just added a Class Section! I just added a class section to my website where I will post info about upcoming classes and workshops. I will be teaching mosaics at The Creative Arts Center in Dallas starting at the end of August. I have been self employed for so very long that I can not recall the last time I had a job commitment that required me to leave the house on specific days. I am looking forward to it and yet I am also a little nervous. What if my classes don’t make and nobody signs up? What if people ask me questions that I can’t answer? What if, what if, what if? In reality I think I will do great, and I am very much looking forward to it. Teaching seems like the next logical step in my growth as an artist. Above: ” Puttin’ On The Ritz”. 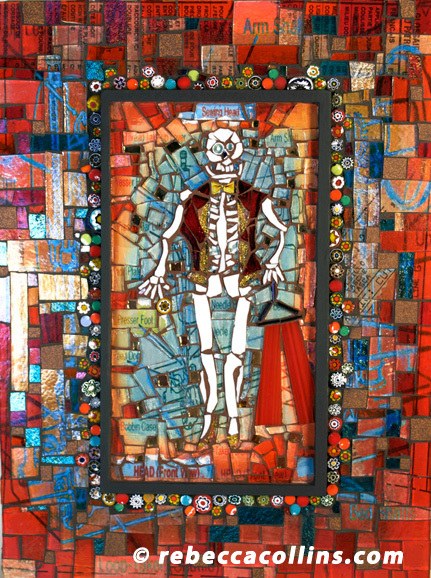 Day of the Dead piece created in memory of Paul.